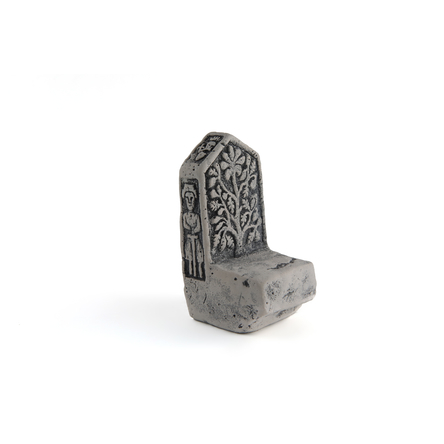 The stone throne from Bukovica probably was a royal throne of Jelena Gruba, the only independent Bosnian queen who reigned after the death of her husband Dabiša (1395-1398). The throne has a massive back, decorated on the front with a tree of life, while the left and right lateral sides have human figures carved in. On the left a female figure is shown bearing a Bosnian royal crown, probably figure of the queen Jelena. On the right side a male figure is shown, bearing a sword, having no royal insignia. However, the sword as a symbol of authority suggests this could be a royal judge or official.